THE DB Sports Tours Small Sided Games Summer Cup promises to be the event of the summer and we are delighted to announce exciting new adjustments to the format. Following the Dublin District Schoolboy League’s exciting changes to their small-sided games and Under-12 sections for the coming season, DB Sports Tours would not only like to congratulate them, but we are following their lead. 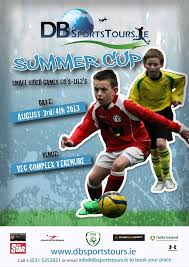 The Summer Cup – the first of it’s kind small sided games tournament in Ireland – will now give players and coaches the chance to experience the changes first. Everyone else will have to wait until September to get the benefits of the DDSL’s new direction, but Summer Cup teams will get a headstart on the weekend of August 3rd and 4th at VEC Football Club. Play 5 a side (5×5) Team of 10 to make up two games. Teams to play across the current small sided pitch – thus enabling 2 games to take place at the same time i.e. if a team arrives with 10 players, then 2 x 5 a side matches can play, if a team arrives with 9 players, then a 5 a side on one pitch with 4 a side on other pitch. Goals to be turned on back – making goal smaller OR use 5- a side goals. Each game to be 3 x 10 mins with 2 mins interval between each session. Play for fun but learning foot-skill at the same time. Size 3 ball to be used. Play 20 mins each way. Size 4 ball to be used. Pitch dimensions: 70 yards long x 50 yards wide. Play on 11 a side pitch from 18 yard line to 18 yard line (different colour paint can be used to mark out the pitch lines). Use same 11 a side sidelines. Play 30 mins each way. All players must play. Small Sided Goals to be used. No Offside.